C.S. Lewis, J.R.R. Tolkien, Graham Greene, Evelyn Waugh, Jorge Luis Borges, Gabriel García Márquez, Karel Čapek, Ernest Hemingway, Agatha Christie, Ronald Knox, Anthony Burgess, E. F. Schumacher, Orson Welles, Dorothy Day, Franz Kafka, Brian McLaren, R. A. Lafferty, Philip Yancey, Terry Pratchett, and J K Rowling. Gilbert Keith Chesterton (May 29, 1874 – June 14, 1936) was an influential English writer of the early twentieth century. His prolific and diverse output included journalism, poetry, biography, Christian apologetics, fantasy, and detective fiction. Chesterton has been called the "prince of paradox." He wrote in an off-hand, whimsical prose studded with startling formulations. For example: "Thieves respect property. They merely wish the property to become their property that they may more perfectly respect it." He is one of the few Christian thinkers who are admired and quoted equally by liberal and conservative Christians, and indeed by many non-Christians. Chesterton's own theological and political views were far too nuanced to fit comfortably under the "liberal" or "conservative" banner. And in his own words he cast aspersions on the labels saying, "The whole modern world has divided itself into Conservatives and Progressives. The business of Progressives is to go on making mistakes. The business of the Conservatives is to prevent the mistakes from being corrected." He was the cousin of A. K. Chesterton. Born in Campden Hill, Kensington, London, Chesterton was educated at St. Paul's School. He attended the Slade School of Art in order to become an illustrator and also took literature classes at University College but did not complete a degree at either. In 1896 Chesterton began working for the London publisher Redway, and T. Fisher Unwin, where he remained until 1902. During this period he also undertook his first journalistic work as a freelance art and literary critic. In 1901 he married Frances Blogg, to whom he remained married for the rest of his life. In 1902 he was given a weekly opinion column in the Daily News, followed in 1905 by a weekly column in The Illustrated London News, for which he would continue to write for the next thirty years. According to Chesterton, as a young man he became fascinated with the occult and, along with his brother Cecil, experimented with Ouija boards. However, as he grew older, he became an increasingly orthodox Christian, culminating in his conversion to Roman Catholicism in 1922. He usually wore a cape and a crumpled hat, with a swordstick in hand, and had a cigar hanging out of his mouth. Chesterton often forgot where he was supposed to be going and would miss the train that was supposed to take him there. It is reported that on several occasions he sent a telegram to his wife from some distant (and incorrect) location, writing such things as "Am at Market Harborough. Where ought I to be?" to which she would reply, "Home." Chesterton loved to debate, often engaging in friendly public debates with such men as George Bernard Shaw, H. G. Wells, Bertrand Russell and Clarence Darrow. According to his autobiography, he and Shaw played cowboys in a silent movie that was never released. Chesterton died on June 14, 1936, at his home in Beaconsfield, Buckinghamshire. The homily at Chesterton's Requiem Mass in Westminster Cathedral, London, was delivered by Ronald Knox. Chesterton is buried in Beaconsfield in the Catholic Cemetery. Chesterton's estate was probated at 28,389 pounds sterling. Chesterton wrote around 80 books, several hundred poems, some two hundred short stories, four thousand essays, and several plays. He was a literary and social critic, historian, playwright, novelist, Catholic theologian and apologist, debater, and mystery writer. He was a columnist for the Daily News, the Illustrated London News, and his own paper, G. K.'s Weekly; he also wrote articles for the Encyclopedia Britannica. His best-known character is the priest-detective Father Brown, who appeared only in short stories, while The Man Who Was Thursday is arguably his best-known novel. He was a convinced Christian long before he was received into the Catholic Church, and Christian themes and symbolism appear in much of his writing. In the United States, his writings on distributism were popularized through The American Review, published by Seward Collins in New York. Of his non-fiction, Charles Dickens (1903) has received some of the broadest-based praise. According to Ian Ker (The Catholic Revival in English Literature, 1845-1961, 2003), "In Chesterton's eyes Dickens belongs to Merry, not Puritan, England" (see Merry England); Ker treats in chapter 4 of that book Chesterton's thought as largely growing out of his true appreciation of Dickens, a somewhat shop-soiled property in the view of other literary opinions of the time. Much of Chesterton's work remains in print, including collections of the Father Brown detective stories. Ignatius Press is publishing a Complete Works. Typically, Chesterton combined wit with a serious point (here, human sinfulness) and self-deprecation. The roots of his approach are found in two earlier strands in English literature; Dickens is one. The other is the use of paradox against the complacent acceptance of the status quo. In this respect, he is often categorized with Oscar Wilde and George Bernard Shaw, whom he knew well. Both were Victorian satirists and social commentators in a tradition that includes Samuel Butler (1835-1902). Chesterton is often associated with his close friend, the poet and essayist Hilaire Belloc. Shaw coined the name Chesterbelloc for their partnership, and this stuck. Though they were very different men, they shared many beliefs; Chesterton eventually joined Belloc in his natal Catholicism, and both voiced criticisms towards capitalism and socialism. They instead espoused a third way: distributism. Hugh Kenner asserts that “He and Belloc had powerful minds, which their contrived personalities hid from the periodical public and also inhibited from real use.” G. K.'s Weekly, which occupied much of Chesterton's energy in the last 15 years of his life, was the successor to Belloc's New Witness, taken over from Cecil Chesterton, Gilbert's brother who died in World War I. The Napoleon of Notting Hill (1904) Full text online. Retrieved May 31, 2007. The Man Who Was Thursday (1907) Full text online. Retrieved May 31, 2007. Chesterton's The Everlasting Man contributed to C. S. Lewis's conversion to Christianity. In a letter to Sheldon Vanauken (December 14, 1950)  Lewis calls the book "the best popular apologetic I know," and to Rhonda Bodle he wrote (December 31, 1947), "the [very] best popular defence of the full Christian position I know is G. K. Chesterton The Everlasting Man." The book was also cited in a list of ten books that "most shaped his vocational attitude and philosophy of life." Chesterton's biography of Charles Dickens was largely responsible for creating a popular revival for Dickens' work as well as a serious reconsideration of Dickens by scholars. T. S. Eliot and Peter Ackroyd, among others, were impressed by his scholarship. 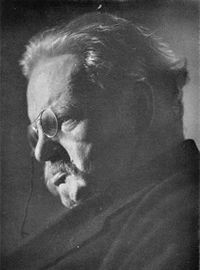 Chesterton's writings have been praised by such authors as Ernest Hemingway, Graham Greene, Frederick Buechner, Evelyn Waugh, Jorge Luis Borges, Gabriel García Márquez, Karel Čapek, David Dark, Paul Claudel, Dorothy L. Sayers, Agatha Christie, Sigrid Undset, Ronald Knox, Kingsley Amis, W. H. Auden, Anthony Burgess, E. F. Schumacher, Orson Welles, Dorothy Day and Franz Kafka. Chesterton's Orthodoxy is considered a religious classic by many. Philip Yancey said that if he were "stranded on a desert island … and could choose only one book apart from the Bible, I may well select Chesterton's own spiritual autobiography, Orthodoxy." His physical appearance and apparently some of his mannerisms were a direct inspiration for the character of Dr. Gideon Fell, a well-known fictional detective created in the early 1930s by the Anglo-American mystery writer John Dickson Carr. Ingmar Bergman considered Chesterton's little known play Magic to be one of his favorites and even staged a production in Swedish. Later he reworked Magic into his movie The Magician in 1958. Also known as Ansiktet the movie and the play are both roughly similar although the two should not be compared. Both are essentially the work of two authors with widely different world views. Some conservatives today have been influenced by his support for distributism. A. K. Chesterton, the right-wing journalist and the first chairman of the National Front, was a cousin. The Third Way (UK) campaigns for the widespread ownership of property, distributism, which he espoused. EWTN features a television series, G. K. Chesterton: The Apostle of Common Sense, that focuses on Chesterton and his works. ↑ Douglas, J. D. “G.K. Chesterton, the Eccentric Prince of Paradox.” August 1, 2001. Retrieved May 31, 2007. ↑ The Man Who was Thursday, Chapter IV. Wikisource. Retrieved May 31, 2007. ↑ Illustrated London News (April 19, 1924). ↑ Wilson, A. N. Hilaire Belloc. Penguin Books. 1984. ↑ Ward, Maisie. Gilbert Keith Chesterton, Chapter XV. Sheed & Ward. 1944. ↑ Quoted in Philip Yancey (2001), Soul Survivor, p. 58. ↑ Chesterton. G. K. Heretics, Chapter 7. Retrieved May 31, 2007. ↑ Chesterton, G. K. Heretics, Chapter 4. Retrieved May 31, 2007. ↑ Chesterton, G. K. Heretics, Chapter 20. Retrieved May 31, 2007. ↑ Chesterton, G. K. Orthodoxy, Chapter 3. Retrieved May 31, 2007. ↑ Chesterton, G. K. The Ballad of the White Horse, Book 2. Retrieved May 31, 2007. ↑ Kenner, H., A Sinking Island, p. 111. ↑ “Last orders: Review.”,The Guardian (April 9, 2005). Retrieved May 31, 2007. ↑ Chesterton, G.K. The New Jerusalem, Chapter 12. Retrieved May 31, 2007. ↑ Coren, M. Gilbert: The Man Who Was G. K. Chesterton, p. 216. ↑ The Christian Century, June 6, 1962. ↑ Yancey, Philip. 2001. Soul Survivor, p. 45. Kenner, Hugh. Paradox in Chesterton, 1947. McLuhan, Marshall. "G.K. Chesterton: A Practical Mystic." Dalhousie Review 15 (4), 1936. Biography of G. K. Chesterton at the Christian Classics Ethereal Library. G. K. Chesterton: The Apostle of Common Sense Produced by EWTN - Real Audio Archives include 28 Episodes with an overview of Chesterton. History of "G. K. Chesterton"
This page was last modified on 16 May 2017, at 19:22.